Name Variation John Mahnenschmidt was also known as Moneysmith. John Mahnenschmidt married Susanna Altman, daughter of Johann Wilhelm Altman and Maria Barbara Scholl. Name Variation John George Altman was also known as George. John George Altman married Anna Catherina Cherry. John George Altman was born circa 1770 at Westmoreland, Pennsylvania. He was the son of Johann Wilhelm Altman and Maria Barbara Scholl. John George Altman died on 27 November 1824 at Blacklick, Indiana, Pennsylvania. Name Variation Anna Catherina Cherry was also known as Catherine. Married Name Her married name was Altman. Anna Catherina Cherry married John George Altman, son of Johann Wilhelm Altman and Maria Barbara Scholl. Anna Catherina Cherry died circa 1824. Married Name circa 1783 As of circa 1783,her married name was Eiseman. Justena Altman was born circa 1767. Justena Altman married Peter Eiseman circa 1783. Justena Altman died circa 1800 at Pennsylvania. Peter Eiseman was born on 24 January 1754 at Pennsylvania. He married Justena Altman, daughter of Johann Wilhelm Altman and Maria Barbara Scholl, circa 1783. Peter Eiseman died in 1817. Married Name 1801 As of 1801,her married name was Miller. Susanna Eiseman was born on 24 January 1786 at Pennsylvania. She was the daughter of Peter Eiseman and Justena Altman. Susanna Eiseman married Michael Miller in 1801. Susanna Eiseman died on 13 December 1863 at Pennsylvania at age 77. Michael Miller was born on 16 July 1783 at Pennsylvania. He married Susanna Eiseman, daughter of Peter Eiseman and Justena Altman, in 1801. Michael Miller died on 13 October 1860 at Pennsylvania at age 77. John M. Miller was born on 7 March 1806 at Pennsylvania. He was the son of Michael Miller and Susanna Eiseman. John M. Miller married Sarah Fox circa 1828. John M. Miller died on 7 January 1866 at Pennsylvania at age 59. Married Name circa 1828 As of circa 1828,her married name was Miller. Sarah Fox was born on 19 January 1810 at Pennsylvania. She married John M. Miller, son of Michael Miller and Susanna Eiseman, circa 1828. Sarah Fox died on 8 March 1866 at Pennsylvania at age 56. William Altman was born in 1794 at Pennsylvania. He was the son of John George Altman and Anna Catherina Cherry. William Altman married Elizabeth (?) circa 1824. Married Name circa 1824 As of circa 1824,her married name was Altman. Elizabeth (?) was born in 1807. She married William Altman, son of John George Altman and Anna Catherina Cherry, circa 1824. William H. Altman was born in 1840 at Illinois. He was the son of William Altman and Elizabeth (?). William H. Altman married Miriam Lemen on 22 December 1864 at Illinois. Married Name 22 December 1864 As of 22 December 1864,her married name was Altman. Miriam Lemen was born in 1842. She married William H. Altman, son of William Altman and Elizabeth (? ), on 22 December 1864 at Illinois. Miriam Lemen died in 1921 at Illinois. Harry Preston Altman was born on 5 December 1867 at Illinois. He was the son of William H. Altman and Miriam Lemen. Harry Preston Altman married Grace E. Smith on 7 October 1891 at Illinois. Harry Preston Altman died on 24 July 1930 at Illinois at age 62. Married Name 7 October 1891 As of 7 October 1891,her married name was Altman. Grace E. Smith was born on 6 August 1867 at Illinois. She married Harry Preston Altman, son of William H. Altman and Miriam Lemen, on 7 October 1891 at Illinois. Grace E. Smith died on 18 July 1933 at Illinois at age 65. Married Name Her married name was Elliot. Henrietta Graham married John Elliot. Henrietta Graham was born in 1812 at Union, Pennsylvania. She was the daughter of Alexander Graham and Maria Margaret Spyker. Henrietta Graham died on 9 May 1872 at Philadelphia, Pennsylvania. John Elliot married Henrietta Graham, daughter of Alexander Graham and Maria Margaret Spyker. (?) Simons died before 1900. He married Louisa Cushard, daughter of Henry Cushard and Christina Mercer, before 1900. Joseph Gongaware married Barbara Altman, daughter of Johann Peter Altman and Christiana Eisenman. Thomas F. Dougherty married Katherine A. Lee, daughter of John Lee and Katherine J. Hogan. Louis Alfred Rupp was born on 14 January 1913 at Idaho. He was the son of Engelbert John Rupp and Regina Peters. Louis Alfred Rupp died on 11 January 2009 at Oregon at age 95. In 1942 at World War II Draft Registration, Gresham, Oregon, nearest relative is son Louis. Name Variation Johannes Gottlieb Rupp was also known as Johann G.
Name Variation Johannes Gottlieb Rupp was also known as John G.
Name Variation Johannes Gottlieb Rupp was also known as Roupp. Johannes Gottlieb Rupp was born on 22 August 1858 at Wisconsin. He was the son of Peter Rupp and Rosina Bar. Johannes Gottlieb Rupp was baptized on 26 December 1858 at St Paul Evangelical Lutheran Church, Platteville, Grant, Wisconsin. He married Anna Regina Cordts on 8 May 1895 at Grant, Wisconsin. Johannes Gottlieb Rupp married Anna Wilkins in 1907 at 2nd marriage for him; 1st for her. 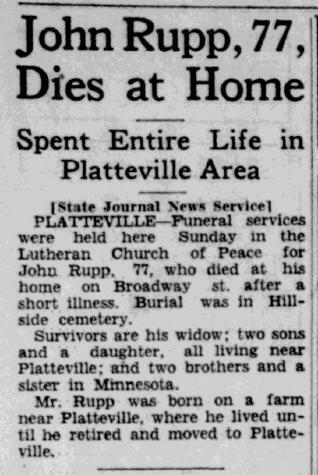 Johannes Gottlieb Rupp died in October 1935 at at home, Platteville, Grant, Wisconsin, at age 77 John Rupp, 77, obituary. [S245] U.S. Federal Census 1900 U.S. Federal Census, by Ancestry.com, Year: 1900; Census Place: Platteville, Grant, Wisconsin; Roll: 1790; Enumeration District: 0050; FHL microfilm: 1241790. Name Variation Anna Wilkins was also known as Annie. Married Name circa 1907 As of circa 1907,her married name was Roupp. Married Name circa 1907 As of circa 1907,her married name was Rupp. Anna Wilkins was born on 11 July 1870 at Hanover, Germany. She married Johannes Gottlieb Rupp, son of Peter Rupp and Rosina Bar, in 1907 at 2nd marriage for him; 1st for her. Anna Wilkins died on 8 July 1944 at Platteville, Grant, Wisconsin, at age 73 Mrs John Rupp (Anna Wilkins), 73, obituary. She was buried after 8 July 1944. Anna Wilkins had 1 with 1 living in 1910 children. Oswald William Rupp was born on 8 August 1898 at Wisconsin. He was the son of Johannes Gottlieb Rupp and Anna Regina Cordts. Oswald William Rupp married Elsie Bellmeyer in January 1936. Oswald William Rupp died between 1974 and 1977. Name Variation Robert T. Rupp was also known as Robert C.
Robert T. Rupp was born circa 1911 at Wisconsin. He was the son of Johannes Gottlieb Rupp and Anna Wilkins. Robert T. Rupp married Lucile Hildreth after 1930. 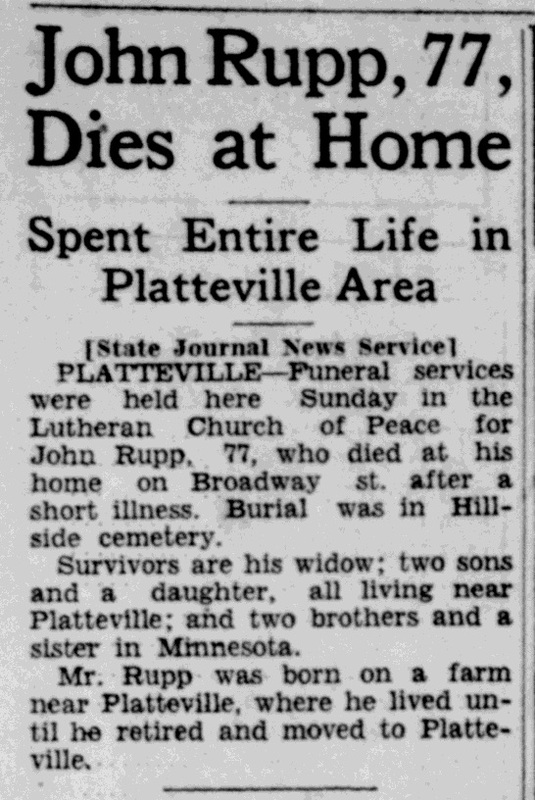 Robert T. Rupp died in September 1974 at Madison, Dane, Wisconsin, Robert C Rupp obituary. Name Variation Peter Rupp was also known as Roupp. Peter Rupp was born in June 1833 at Caildorf, Wurtemburg, Germany, also reported as June 1838. He married Rosina Bar on 2 July 1857 at Grant, Wisconsin. 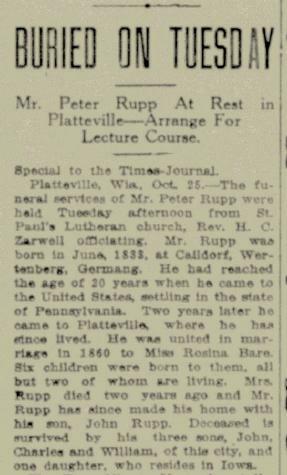 Peter Rupp died on 20 October 1917 at age 84 Peter Rupp obituary. Name Variation Rosina Bar was also known as Bahr. Name Variation Rosina Bar was also known as Bâhr. Name Variation Rosina Bar was also known as Rosa. Name Variation Rosina Bar was also known as Baer. Name Variation Rosina Bar was also known as Lucina. Name Variation Rosina Bar was also known as Rosy. Married Name 2 July 1857 As of 2 July 1857,her married name was Rupp. Married Name 2 July 1857 As of 2 July 1857,her married name was Roupp. Rosina Bar was born in October 1831 at Wurtemburg, Germany. She married Peter Rupp on 2 July 1857 at Grant, Wisconsin. Rosina Bar died circa 1915. Rosina Bar had 6 with 4 living in 1900 children. She had 6 with 4 living in 1910 children. Name Variation Anna Regina Cordts was also known as Regina. Married Name 8 May 1895 As of 8 May 1895,her married name was Rupp. Anna Regina Cordts was born in October 1862 at Germany. She married Johannes Gottlieb Rupp, son of Peter Rupp and Rosina Bar, on 8 May 1895 at Grant, Wisconsin. Anna Regina Cordts died before 1907. Anna Regina Cordts had 2 with 1 living in 1900 children. Married Name 19 December 1796 As of 19 December 1796,her married name was Martin. Elizabeth Huddleston was born in 1760 at Bedford, Bedford, Virginia. Elizabeth Huddleston married Job Martin on 19 December 1796 at Bedford, Virginia. Elizabeth Huddleston died in October 1850 at Beckwith, Fayette, Virginia. Job Martin was born on 11 April 1753 at Bucks, Pennsylvania. He married Elizabeth Huddleston, daughter of William Huddleston and Martha Myers, on 19 December 1796 at Bedford, Virginia. Job Martin died on 9 November 1839 at Kanawha, Kanawha, West Virginia, at age 86.